In the 300 piece jigsaw puzzle, State Holiday Stamps by White Mountain, a collage featuring several different holiday themed stamps is depicted. 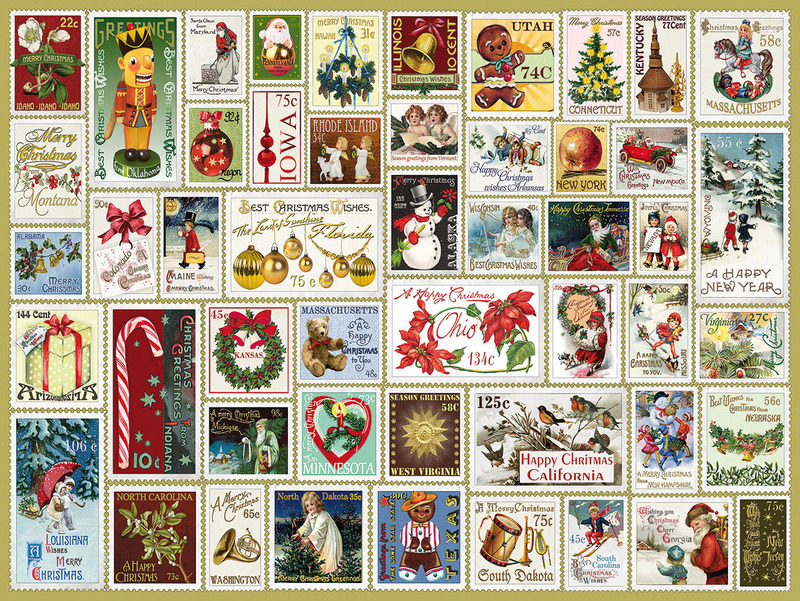 Some of these stamps include designs of Santa Claus, decorated wreaths and trees, bears, sleighs, and snowmen! Other stamps feature a mailbox full of packages and letters, angels flying in the sky, gingerbread men, and a festive nutcracker. Paired with these images are some of the states of America! The diversity of this collage perfectly conveys the Christmas spirit. This puzzle is sure to warm the hearts of many on a cold winter night! This is terrific fun in a collage puzzle. As soon as I saw it I had to have it, and it didn't disappoint. I'm normally not a fan of collages, but the larger pieces made a difference.